Greenleaf Book Group, 9781608325887, 168pp. 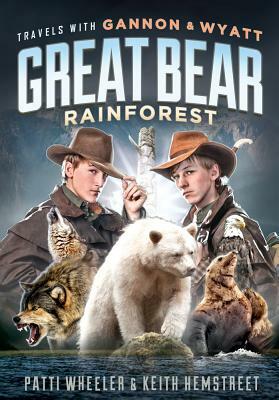 Gannon and Wyatt can t wait to trek into the Great Bear Rainforest in search of the mythical spirit bear, but surviving in this unforgiving wilderness proves more challenging than they could have ever imagined. When members of the expedition go missing, the brothers bravely set out on a search-and-rescue mission. Soon they find themselves lost in a forest teeming with grizzlies, wolves and mysterious gunmen. Guided by the wisdom of the First Nation people, the Gannon and Wyatt uncover a sinister plot and must risk everything to save those who are missing and restore balance to the Great Bear. In the tradition of the historic journals kept by explorers such as Lewis and Clark, Dr. David Livingstone, and Captain James Cook comes the adventure series Travels with Gannon and Wyatt. From Africa to the South Pacific, these twin brothers have traveled the world. You never know what they will encounter as they venture into the wild, but one thing is certain?wherever Gannon and Wyatt go, adventure is their constant companion. You can find Gannon and Wyatt's blog, photographs, and video footage from their real-life expeditions at travelswithgannonandwyatt.com. Patti Wheeler, Gannon and Wyatt s mother, is the cocreator of Funnays, a clothing and product line that she helped grow from fledgling start-up to publicly traded company. In 1998, she formed the Wheeler Investment Group. For years, it has been Patti s goal to create a children s book series that instills the spirit of exploration in young people. (Future books in this series include adventures in Egypt and the Serengeti.) In addition to the book series, Patti is executive producer and director of the TV pilot Travels with Gannon and Wyatt: Off the Beaten Path: Egypt and cowriter, with Keith Hemstreet, of the screenplay Botswana, which was an official selection of the 2010 Beverly Hills Film Festival. Keith Hemstreet worked as a producer/writer on the television series Playground Earth, an extreme sports variety show broadcast on Fox Sports Net. His writing has been nominated as a finalist for the Pirate s Alley/Faulkner Award, the New Century Writer s Award, and the Zoetrope Screenwriting Competition. "